There are two ways to approach a problem: Walk away from it or try to solve it. In the latter case, when people become invested in an idea they want to make work — hurdles or not — most often they will succeed. Over the years, I have seen this time and time again on farms and in the research community. Passion to make something work sometimes has more to do with success than weather or markets. Alfalfa is the predominant forage legume in much of the North and West. Soil is fertile, pH is optimal or at least manageable, and growing conditions are for the most part conducive to high yields even if irrigation is needed in more arid climates. This is not to say that every region doesn't have its battles to fight — winterkill in the North, rodents and a plethora of insect pests in the West, diseases pretty much everywhere. Nevertheless, alfalfa remains the forage legume of choice in much of the U.S. because of its feeding, soil, and crop rotation attributes. In the Southeast, states such as Georgia, Alabama and Florida, alfalfa fields are about as frequent as a white Christmas in that part of the world. Tall fescue and warm-season species such as bermudagrass and bahiagrass comprise the perennial forage backbone in the Southeast; they are complemented with cool-season cereals (rye, wheat, triticale) and forage grasses (ryegrass) for the winter months. A variety of forage legumes, mostly annuals, are also utilized. Managed appropriately, the bevy of Southeast warm and cool-season species comprises a forage-producing machine, but one with a high nitrogen demand. Alfalfa may soon play a more prominent role than it has in the past. Even the most avid alfalfa cheerleaders in the Southeast don’t envision the crop dominating the landscape, nor should they. There are soils in the region that cruise at a soil pH of 4.5 to 5.0. Further, some aren't particularly well drained. Add in the summer heat and, in some cases, you just have to tip your cap and walk away from alfalfa. So, why has there been a building interest for alfalfa in the Southeast? It's probably several reasons. Front and center is the fact that alfalfa varieties have been and are currently being developed for Southeast conditions. Joe Bouton, professor emeritus at the University of Georgia, is responsible for developing varieties such as AlfaGraze, Bulldog 505 and Bulldog 805. The University of Florida has also initiated an alfalfa breeding effort that promises to yield results in the near future. Given the correct tools (adapted varieties), extension specialists and educators have begun to take alfalfa to the field. Further, as is often the case, some producers have taken it upon themselves to establish alfalfa, both small and large acreages. Their successes and challenges add to the knowledge base and make it easier for the next wave of adopters. Alfalfa is being raised for dry hay, silage and is being incorporated into beef grazing systems. Again, not on a large scale at present, but it's being done. At last week's Alabama Forage and Grassland Conference in Eufaula, there were several (yes . . . several) presentations with a full or partial alfalfa focus. The overriding message by all the speakers was loud and clear: Alfalfa has a lot to offer Southern forage producers, but not without a high degree of management. As veteran alfalfa growers already know, optimum soil pH (6.5 to 7.0), copious amounts of potassium compared to most other crops, good drainage, and variety selection are universal alfalfa axioms; pity the producer who tries to challenge them. It's difficult to know exactly the future of alfalfa in the Southeast. 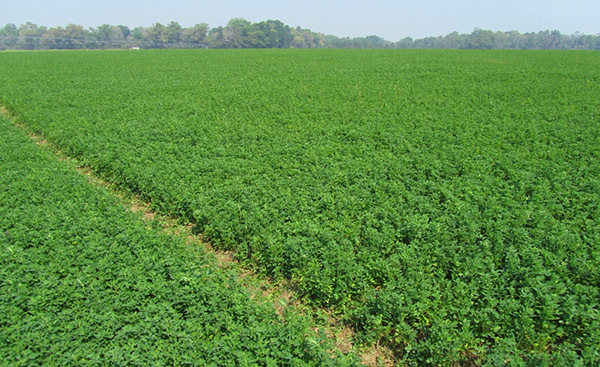 In the National Alfalfa & Forage Alliance's 2009 publication Growing Alfalfa in the South, the authors note that "the region could easily produce and benefit from over 5 million acres (of alfalfa)." Though growing alfalfa in the Southeast, especially on the Coastal Plain, presents some unique challenges compared to other U.S. regions, what we do know is that more production inputs and information for success are available today than has ever been the case. There also appears to be a building passion by some to make alfalfa a bigger part of the South's forage landscape.